Getting laptop financing with bad credit is not impossible. Although you may have bad credit, this doesn’t mean you have to give up on your dream of purchasing a laptop computer. There are several financing options that may allow you to get the computer of your dreams, without having to break the bank. Many people with bad credit never even consider this option but find out soon enough that they made a mistake. Before you jump the gun and begin to search for other ways of financing your purchase, consider a conventional setup through a major retailer or manufacturer. This will allow you to pay off the cost of your laptop in installments, without having to bother with other methods that are often more complicated. With a rent-to-own setup, you are not buying the computer up front. Instead, you are making payments, sometimes for as long as five years, before it is finally yours. One thing you should know about rent-to-own financing is that you will end up paying two to three times as much in the long run. It is good to calculate this before signing an agreement. For example, a rent-to-own computer that costs $800 to purchase would end up costing you anywhere from $1,600 to $2,400 by the time your contract is fulfilled. The premise of buying a laptop through a layaway plan is simple: this allows you to purchase an item without paying the entire cost up front. However, instead of the ability to take possession of the item and make payments, you are required to pay the entire amount in full before it is given to you. This helps to protect the store against people who do not intend to pay on time and in full. In many cases, there are fees involved with the layaway process because the seller has to hold onto the item and store it until the buyer makes all the necessary payments. This type of laptop financing is exactly what it sounds like. If you have bad credit, you can improve your chance of receiving financing by offering a down payment. 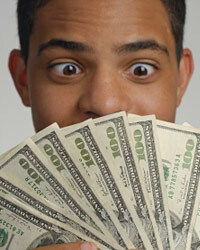 The more money you put down, the better chance you have of the seller offering financing. Those who are interested in this option need to be sure of the terms and conditions before accepting and moving forward. Many people who are interested in buying a laptop do not have enough money to pay for the entire purchase in one lump sum. Along with this, just as many consumers have bad credit that is holding them back from making purchases. With this information, it is easy to see that laptop financing with bad credit is more than possible. Most consumers find that one of the options above fits in nicely with their current financial plans.